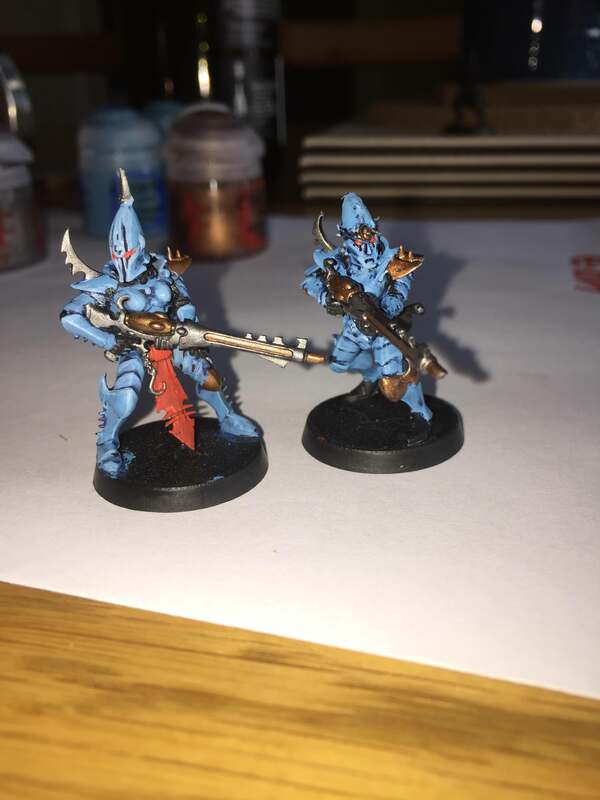 So I'm returning to 40k after a very very long absence and I have half-painted my first couple of models after like 10 years. I'd say I'm neither thrilled nor appalled at my efforts so far but would look to you guys for some help on how to get this main armour colour down as my painting skills were mediocre at best back in the day, and now I'm a little lost! Would love to hear your thoughts on acheiving the right finish. 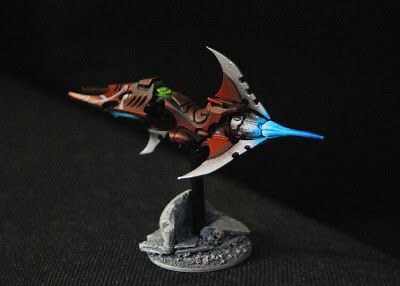 I took a lot of inspiration from Mechanicum Jon's dark eldar (https://www.dakkadakka.com/dakkaforum/posts/list/378881.page) but was unsure about the idea of basecoating them with the blue spray. Let me know what you guys think I could do to improve - I'm eager to get my painting up to a higher standard! 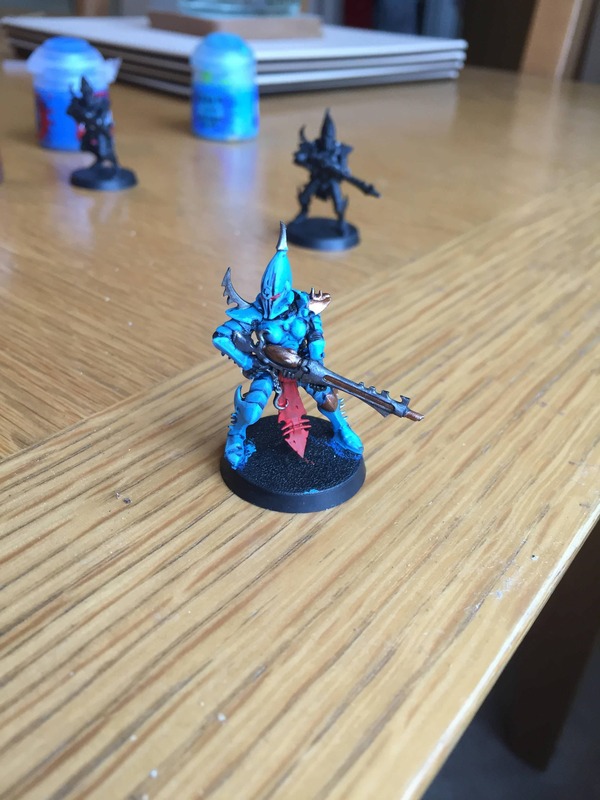 My army has sorta similar paint scheme (blue-white with red/green finishers) so you might want to check out my painting blog and if any model/painting effect catches your interest, drop me a PM here or on Tumblr and I'll be glad to share. Thanks for the tips! I have been thinning my paints but perhaps not enough, I should look up a little more guidance there. Your paint scheme is lovely so I'm gonna drop you a PM! Yea. I recommend watching some vids too. Its actually fun watching the paint to dry. 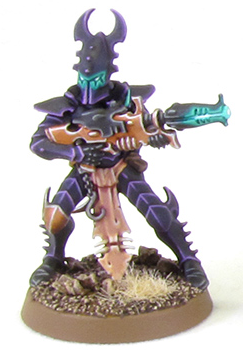 In addition those videos will give you basic ideas of how the colours interact, how different types of paint behave and your painting will cease to be trial and error, but a learned attempt where you will see improvement with every miniature you paint. Watch the games workshop official youtube channel, its really good for beginer painters. All their videos will give you the same basics. Also painting & speed dont really fit in the same sentence, is my only personal advice, sadly. Thin your paints (base & layer) with roughly ~1/3 1/4 water, and apply 2 coats each. Wait for it to completly dry between each coat. For smoothness, 1 word : Lahmia medium. It's a GW technical, basically "water" that dilute your paints, without removing their properties (shade will still go where they are supposed to be, etc.). Another key to improve & get better tabletop results is to improve contrasts. For me you could add a little more white to your highlights (basically 3/4 blue 1/4 white, with a drop of lahmia) for your first hightlight, and the add a second highlight with ~2/3blue 1/3 white, hell even try 1/2 both. To apply only on edgier edges. Also spend some time on your bases, GW now offers nice technical to do them nice & clean very quickly. With you'r blue color scheme, you might try the red mars stuff, should make em' pop ! Lahmia works with everything, it's basically the diluant of every paint, without any pigment. 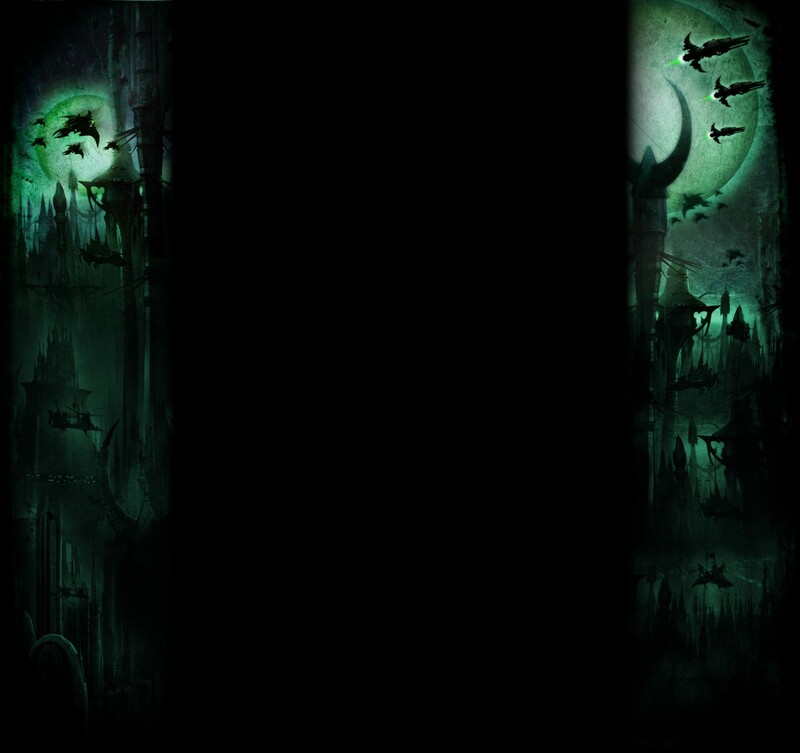 You can also use it as a matt varnish (example : official warhamaerTv tutorial, Alarielle scarab horns, around 6 mins). But mainly yeah it's a paint/shade thinner, mainly used to create custom 'glacis' (can't remember the EN term) in order to make puerfect gradients (example : official power sward tutorial)). Also mentionned before, I recommand adding a drop to your mixes, it helps getting paints more blended. - Gently get rid of molding marks before priming, they are some tutorials on the web about it. 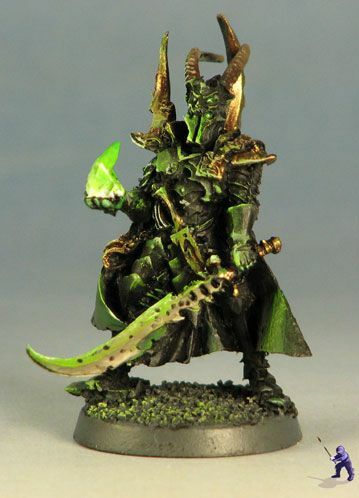 - A "quick" way to add personnality and prestige to your army is to add OSL (Oriented Source Light) effects to your miniatures. 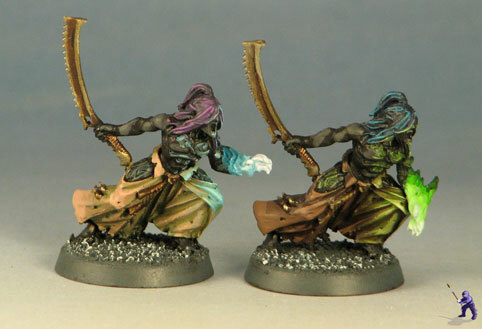 Again they are lots of tutorials ( Chest of color OSL tuto ) and example freely accessible. But don't overuse it, pick one or 2 max for your army, maybe 3 on character. Honestly with lahmia & some practice it's not that hard nor time consuming. I love these glowing effects. How do you do them without a paint brush? Put paint on a finger. If you meant without an air brush, and with a paint brush, simply dilute really thinly your paint with lahmia (9/10 lahmia). Apply on a large zone. Apply on smaller zone inside the first. Apply on smaller zone inside the second. The more layers, the more intense the color will go. This will ensure a nice gradient. Follow chest of color tut to know how to apply, it's too long to explain on a forum post (and already done with beautiful pictures..). Just a hint : for metals, use diluted inks istead of paints/shades, this way you won't loose the shininess of metals (else they will look all flat).